Whitney Vickers | Fairborn Herald Flamingos will soon flock local yards to help support the Fairborn Music Club which supports funding for music programs at Fairborn City Schools. 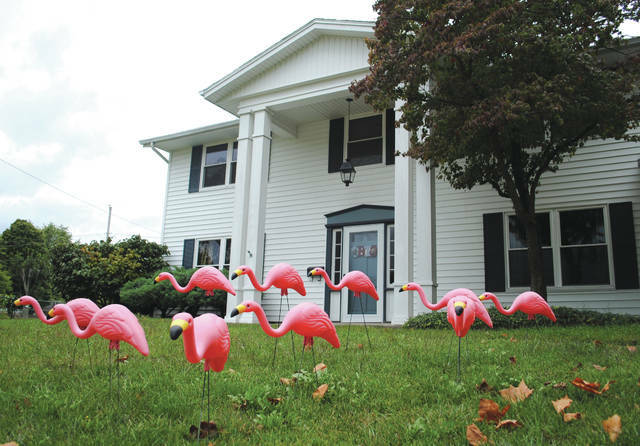 FAIRBORN — Pink flamingos have migrated back to the community and will soon flock local yards — but for a good cause. 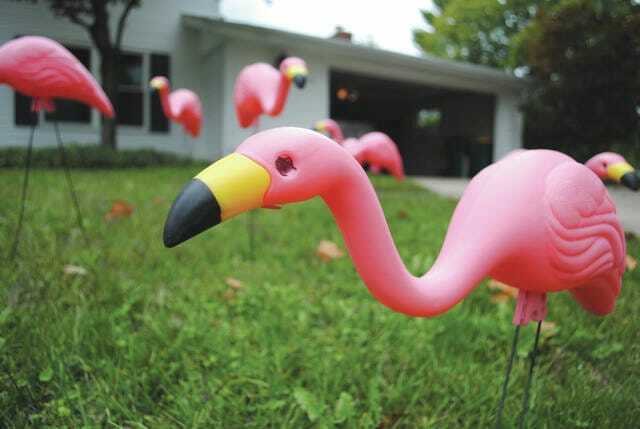 The Fairborn Music Club will flock yards within the Fairborn City School District for $1 per plastic bird to support the music programs at Fairborn City Schools. Funds will benefit the club’s current goal of raising enough money to purchase new uniforms as well as pay for travel expenses as the band participates in various competitions in varying area and more. Club officials said the uniforms are at least 10-15 years old. Music club officials said the flamingos raised $1,000 toward the cause last year and sparked fun pranks among the city. For example, they said one individual paid $100 for 100 birds in someone’s yard. They added that some nights call for the flocking of two-to-five yards in one night. The birds must stay for two days and will be picked up by music club officials. During the fundraiser last year, 20 birds went missing but were found shortly after. Anti-flocking insurance is also an option for $10. The following options are available: small flock (10 flamingos) – $10 donation; medium flock (20 flamingos) – $20 donation; large flock (30 flamingos) – $30 donation; super-size flock (40 flamingos) – $40 donation; other size flock (x 10 Flamingos) – $1 per bird donation. The Fairborn Music Club can also take special instructions. To participate and support the Fairborn Music Club in the process, individuals can donate to the fundraiser (cash or check payable to the Fairborn Music Club) in exchange for a flocking at the address of choice. https://www.fairborndailyherald.com/wp-content/uploads/sites/50/2017/09/web1_DSC_0822.jpgWhitney Vickers | Fairborn Herald Flamingos will soon flock local yards to help support the Fairborn Music Club which supports funding for music programs at Fairborn City Schools. https://www.fairborndailyherald.com/wp-content/uploads/sites/50/2017/09/web1_DSC_0829.jpgWhitney Vickers | Fairborn Herald Flamingos will soon flock local yards to help support the Fairborn Music Club which supports funding for music programs at Fairborn City Schools.